China is the world’s biggest carbon polluter, emitting about twice as much CO2 as the United States. Much of that carbon comes from coal, which still constitutes about 70 percent of China’s energy mix. But that dirty fuel has led to notoriously bad air quality in China’s cities. So, the country has begun shutting down urban coal plants, and investing heavily in carbon-free alternatives, such as wind, nuclear and solar—like this “floatovoltaic” solar farm on the site of a former coal mine. As the country becomes more wealthy, car culture is taking off too, and Chinese leaders are betting heavily on electric vehicles to improve air quality, and dominate a growing global market. In this segment, Ira talks with Beach and Princeton University’s Denise Mauzerall about China’s growing energy needs, and how its leaders are reinventing the country’s energy economy. 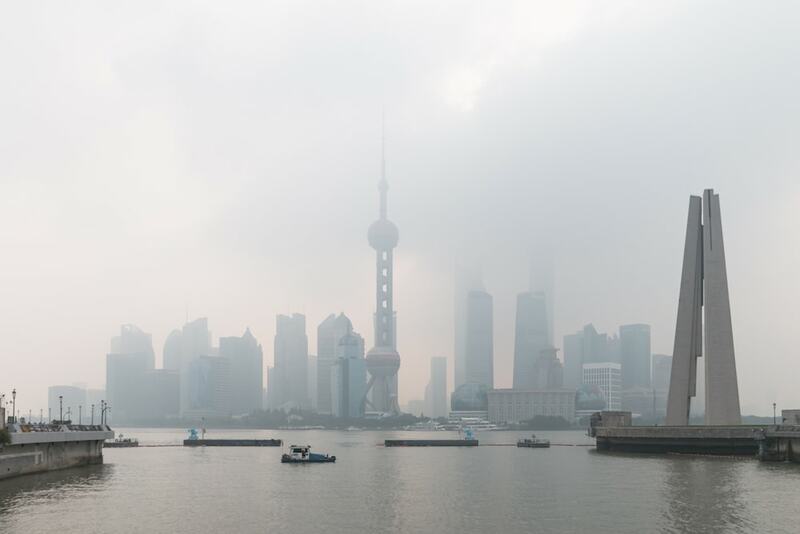 Denise Mauzerall: I’ve been in China starting back as far as 1990, and in the previous 10 years when I’ve been there, the air pollution has been so bad that you could often not see across the street clearly, and two blocks away would be blurred out by the air pollution. This trip, I was in Beijing and you could easily see ten miles…The government has [greatly reduced] the use of coal in small stoves that are often used for heating in the residential areas in the Beijing region. And there’s been a move towards much more stringent vehicle standards and much more stringent standards for power plants. And in addition to that, meteorology has helped them this winter. Rather than getting dirty air coming up from southern China they’re getting cleaner air coming in off of the Arctic down from Siberia. Fred Beach: I think they realize they need to electrify transportation to help mitigate their pollution problem going forward, and, somewhat like solar PV, I think they want to kind of own that market space. As the world in general goes that way, I think they want to get ahead of the curve and be one of the leading suppliers, globally and for themselves. Denise Mauzerall: They have declared a war on air pollution and they’ve committed China to peaking their carbon dioxide emissions by 2030 or sooner. In fact, if you look at the CO2 emissions from China over the last few years, they’ve actually been fairly constant. They grew extraordinarily fast over the previous decade or so and surpassed the United States as the largest emitter in 2006, but they’re flat now…Right now they have an excess coal capacity and they have a moratorium on building coal fired power plants at the moment, and they are going gangbusters on building solar PV and wind farms. Denise Mauzerall: The perspective over there is that the world is their market, and they’re looking outwards right now. They say that the U.S. is less important to them than we might think it might be, and that they’ll be fine. Fred Beach: We’ve got over a hundred-year history in the U.S. of being very ardent supporters of government funded basic research. So to cut that at all—let alone within the clean energy sector—it just doesn’t make sense. China is doing just the opposite. They understand the value of research and development and a lot of the money for that often does come from the government as opposed to the private sector…If I had to characterize the two, I’d say they got it right we’re about to perhaps get it wrong. Denise Mauzerall: And it also seems very strange that there’s this war on renewables here as opposed to a war on air pollution there. I mean if we’re going back to dirty coal we’re really going backwards. Whereas China is looking ahead recognizing its past problems and developing an industrial policy that will make them a leader in the world on clean energy. Denise Mauzerall: I think the U.S. pulling out is not going to deter China from moving forward with renewables. [China] has this new international trade plan called the Belt and Road Initiative, where they are planning to take advantage of somewhat of a global vacuum left by the U.S., and they plan to expand trade on renewable energy and electric vehicles. Fred Beach: That seems curious. We’ve pulled out of the Paris accord, yet our emissions are coming down year on year. China is still a part of the Paris accord, but their agreement is to continue increasing emissions year on year. So, I don’t see how we’re giving up or going away from anything. Correction: Denise Mauzerall wanted to correct a figure she quoted during the segment. She says according to the Department of Energy, 374,000 people work in solar and 160,000 in coal, so solar electricity generation employs twice as many people as coal power. Denise Mauzerall is a professor of Environmental Engineering and International Affairs at Princeton University in Princeton, New Jersey. Fred Beach is Assistant Director for Energy Policy at the Energy Institute at the University of Texas at Austin in Austin, Texas. IRA FLATOW: This is Science Friday. I’m Ira Flatow. The Trump administration is proposing to slash clean energy research budgets by 70%, as reported by The Washington Post, cutting money for fuel efficiency research, biofuels, solar, and focusing instead on fossil fuels and, what the president refers to as, beautiful clean coal. Meanwhile, in China, they are burning a lot of coal, at almost 70% of their energy mix. But China’s leaders are investigating all these alternatives that the president is slashing, plotting a pivot towards electric vehicles, carbon-free energy sources. They’ve installed more wind power than the world’s wind energy leaders– the US, Germany, and India– combined, and they’re planning to build nuclear power plants. And while China has been manufacturing other countries’ solar panels for years, they’re installing a lot of their own now, too, including innovative ideas like a floatovoltaic solar farm floating atop a lake where a coal mine used to be. A symbol of things to come? My next guests have witnessed some of these changes firsthand, and they’re here to talk about China’s energy transformation. Let me first introduce Denise Mauzerall. She’s Professor of Environmental Engineering and Internal Affairs– International Affairs at Princeton. Welcome to Science Friday. DENISE MAUZERALL: Glad to be here. IRA FLATOW: I understand that you just got back from a trip to China. Any big changes you noticed on this latest trip? DENISE MAUZERALL: There was a huge improvement in air quality. I have been in China starting back as far as 1990. And in the previous 10 years, when I’ve been there, the air pollution has been so bad that you could often not see across the street clearly. And two blocks away would be blurred out by the air pollution. This trip, I was in Beijing and you could easily see 10 miles. You could see the mountains that I had never been able to see from downtown before. IRA FLATOW: And what do you attribute this to? What do they attribute it to? DENISE MAUZERALL: I think there’s a number of factors that have contributed to this improvement this winter. From the emissions perspective, one thing that the government has done has been to greatly reduce the use of coal in small stoves that are often used for heating in the residential areas in the Beijing region. And there’s been a move towards much more stringent vehicle standards and much more stringent standards for power plants. And in addition to that, meteorology has helped them this winter. And so rather than getting dirty air coming up from southern China, they’re getting clean air coming in off of the Arctic, down from Siberia, and ventilating the city. So it was great. IRA FLATOW: Yeah, I remember I was there a few years ago, and in the hotel rooms, you got a pair of smoke– of what do you call it? Gas masks (LAUGHING) you could wear because they knew that you were going to go outside sometime. DENISE MAUZERALL: Right. Yeah, when I was there last November, I was handed face masks from some Chinese professors before we went out to dinner. It’s a standard thing to put on as you walk down the street. IRA FLATOW: Well, let’s talk about some of that good news you were talking about. I want to bring on Fred Beach, Assistant Director of Energy Policy at the Energy Institute, University of Texas at Austin. Welcome to Science Friday. FRED BEACH: Thank you for having me. Glad to be here. IRA FLATOW: Denise touched on automobiles, and that’s one of the big changes happening in China, how people get from A to B, right? Is the automobile age hitting China now? FRED BEACH: Oh, it’s more than hit. I believe for the last few years running now, Chinese, on an annual basis, buy more new automobiles than Americans do, which is kind of not a inauspicious goal to have or be number one in the world for. IRA FLATOW: Does that mean that auto emissions, a lot of tailpipe pollution, is going to go up? FRED BEACH: It is going up, and on– particularly in the large, urban areas. You know, we think of a big city in the US being a couple of million people. They’ve got more than a dozen cities with more than 20 million people, so you can talk– think of LA on steroids. And there are several cities like that in China. IRA FLATOW: Are they trying to encourage the development of electric cars or alternative vehicles like that? FRED BEACH: From what I’ve seen, I think so. I’ve visited several automobile manufacturers in China over the years, in particular, BYD is one of the largest. And they– I think they realize they need to electrify transportation to help mitigate their pollution problem going forward. And somewhat like solar PV, I think they want to own that market space. As the world, in general, goes that way, I think they want to get ahead of the curve and be one of the leading suppliers, globally, and for themselves. IRA FLATOW: I know. Denise, one of the big issues with people adopting electric vehicles is not enough places to charge them. Is that an issue in China? DENISE MAUZERALL: That is an issue. I mean, for the internal combustion engines, China has been imposing stricter and stricter emission standards. And so you no longer see emissions coming out of the tailpipes from the internal combustion engines. But in addition to that, you see a major transition, I think, to electric vehicles, ranging from the small scooters– the two stroke engines that used to spew black smoke out, are gone, and they’ve been electrified. Small, truck-like devices that used to be really dirty are excluded from the city, and they’re going electric. The power charging stations are being deployed now, and you can charge your electric vehicle with an app. So you just pay with your phone. But there is some concern that they need to build a lot more in order to support the electric vehicles they plan to build. Their target right now is over a million vehicles for 2018, electric vehicles, and 7 million by 2025. So they’re going into this big time. IRA FLATOW: Our number, 844-724-8255, if you want to talk about clean energy and how China is working on changing the way they make energy. You can also tweet us, @scifri, S-C-I-F-R-I. Fred, how much is China’s electricity demand going up in step with their economic growth? And can they meet it with switching to renewables? FRED BEACH: It’s pretty much going up in lockstep, as we’ve seen in most developing countries during their industrialization area. Energy use goes almost in lockstep with GDP growth. So if they’re recording 6% to 7% per annum GDP growth, their energy use is going up 6% or 7%. And in fact, electricity goes up even a little bit higher. We all want energy, we all want to use more energy. But what we really want is electricity because it’s such a flexible form of energy to use. So their energy load growth is going up even faster than their GDP growth. IRA FLATOW: And Denise, where do Chinese leaders, President Xi and other top officials, stand on all this? Do they think renewables are the future? DENISE MAUZERALL: President Xi Jinping has made a commitment to a beautiful China, as he calls it. They have declared a war on air pollution, and they’ve committed China to peaking their carbon dioxide emissions by 2030 or sooner. In fact, if you look at the CO2 emissions from China over the last few years, they’ve actually been fairly constant. They grew extraordinarily fast over the previous decade or so, and surpassed the United States as the largest emitter in 2006. But they’re flat now. And in my conversations with government officials while I was there last week, there seems to be a fairly sizable debate as to whether they’ve already peaked or if the economy, as it grows, will lead to further increases. Right now, they have excess coal capacity, and they have a moratorium on building coal-fired power plants at the moment. And they are going gangbusters on building solar PV and wind farms. So it’s an open question. IRA FLATOW: Yeah. Well, let’s talk about that a little bit. Fred, can you contextualize for us the move by the Trump administration to cut clean energy research with how China’s leaders view clean energy? They’re going in the opposite direction. FRED BEACH: It is kind of ironic, not just research within clean energy but research– government-funded research in general. I mean, we’ve got over 100 year history in the US of being very ardent supporters of government-funded basic research. So to cut that at all, let alone within the clean energy sector, is kind of– it just doesn’t make sense. China is doing just the opposite. They understand the value of research and development. And a lot of money for that often does come from the government, as opposed to the private sector. So I would say, at the moment, if I had to characterize the two, I’d say they got it right. We’re about to, perhaps, get it wrong. IRA FLATOW: And Denise, I know you were just meeting with energy officials in China, and we just heard about the Trump administration putting a 30% tariff on solar panels. Is that going to do anything to the Chinese solar producers? DENISE MAUZERALL: Well, that’s an interesting question. The perspective over there is that the world is their market, and they’re looking outwards right now. And they say that the US is less important to them than we might think it might be, and that they’ll be fine. The other thing they point out is that a 30% tariff, which is what has just been placed on imported solar panels, would take us back to prices in early 2016 because the price of solar panels has been dropping so fast that a 30% tariff may not appear as onerous domestically as if the prices, for example, were going up. And so they think it may slow things in the US– uptake of solar in the US– but it won’t be a big deterrent to them. IRA FLATOW: Yeah, and I guess the people who will get hurt in this country are the installers, who will have to raise the price of their panels. Maybe install [INAUDIBLE]. FRED BEACH: Well, it’s kind of ironic though. Here in the US, we’ve still got a 30% income tax credit on solar PV installations. So it’s kind of odd that we put a solar– a 30% tariff on the panels at the same time, we’re handing back a 30% income tax credit for people who install them. And it’s also interesting that both these, the tariff and the ITC, are four year phase outs over the next four years. So they’re almost in lockstep going down. IRA FLATOW: Sounds very well thought out. DENISE MAUZERALL: It also seems very strange that there’s this war on renewables here as opposed to a war on air pollution there. I mean, if we’re going back to dirty coal, we’re really going backwards. Whereas China is looking ahead, recognizing its past problems and developing an industrial policy that will make them a leader in the world on clean energy. FRED BEACH: That’s another one that’s ironic, when we say a war on coal. I’m really not sure if it’s a war on coal power plants or a war on coal production in the US. If it’s a war on coal power plants or coal production, they just turn into exports to China. IRA FLATOW: Interesting. Our number 844-724-8255. Let us go to Cincinnati, Ohio. Robert, hi. Welcome to Science Friday. AUDIENCE: Well, I don’t know if you touched on this question already, but where is China getting the energy for the electric cars? And have we reached a tipping point where if there are more electric cars there, they’re getting their sources from renewable sources and that will force United States to do the same? DENISE MAUZERALL: Yeah. So right now, a lot of the power that they’re getting for their electric vehicles is coming from coal. And that– it may increase in the short term, their CO2 emissions from vehicles. But the longer term picture is much more promising because if you have an electric vehicle, you can power it with renewable energy. And as they increase the fraction of their electricity supply that comes from renewables, their electric vehicles will become cleaner and cleaner in terms of CO2 emissions, lower and– less and less CO2 emissions. IRA FLATOW: And what’s this I hear about a floatovoltaic solar farm? I love that word. FRED BEACH: They’ve been around for a while. Japan, I think, was one of the leaders in developing those. It’s just a method of instead of installing solar panels on a roof or some kind of solid structure, you basically install them on floats, in a lake or a pond. It has a couple of benefits. It’s not taking up land, that could be otherwise used for agriculture. And two, solar panels do get hot when the sun is shining on them. That decreases their efficiency during the day time. And by having them floating on top of a lake, that serves as a thermal sink that actually helps the back of the panel stay cool, keeps their efficiency more even. And there’s actually a lot of aqua culture in China as well, in these large ponds and lagoons. I don’t think the particular case you’re talking about was such as that. But again, it gives a way to have actually dual use of land, or in this case, water surface, for solar PV electric generation, as well as aqua farming underneath. IRA FLATOW: And I mentioned they’ve installed more wind power than the world’s wind energy leaders, US, Germany, and India combined? FRED BEACH: I could believe that. FRED BEACH: They’ve always been a huge consumer of their own wind turbine production. Companies like Goldwind have actually had a hard time getting into the international market. So it was almost domestic demand that drove them. They’ve only in the last couple of years gotten to that state with solar. Most all solar PV manufactured in China was exported over the years. And in a way, they used our markets to drive down the manufacturing cost and price. And now, they’re more– became their own internal consumer of their solar PV production. IRA FLATOW: This is Science Friday from PRI, Public Radio International. In case you just joined us, we’re talking about China and its energy future with Denise Mauzerall, Professor of Environmental Engineering and International Affairs at Princeton and Fred Beach, Assistant Director of Energy Policy at the Energy Institute UT, Austin. Our number, 844-724-8255. Now, Denise, China, though, is bullish on nuclear power, right? DENISE MAUZERALL: So China is one of the only countries in the world that’s currently still building new nuclear power plants. And that’s another question that’s open at this point as to whether they are going to go forward even more into nuclear in the future or not. I was told that that’s a very high-level decision that’s likely to come down in the next couple of months. But there are certainly people there who see nuclear as a clean air pollution and CO2-free form of electricity, despite its drawbacks of what to do with radioactive waste and of course, national security issues. IRA FLATOW: Here’s a tweet from Taylor Haskins, who says you should mention that Tesla is all over the map in China, building more chargers all the time. This is a worldwide phenomenon, actually, and deserves to be noted. Which I guess we just did. Did you– have you seen any charging stations, Denise? In China? DENISE MAUZERALL: I did see the charging stations. I didn’t see who was putting them in, but I did see them. And as I mentioned, they’re cool in the way that you pay for the electricity with an app on your phone. It’s all quite seamless. IRA FLATOW: Yeah. All right. Let’s go to Minneapolis to Kathryn. Hi, Kathryn. KATHRYN: Ooh. Hi. Good morning. Home of the Super Bowl. I have a couple of questions. Number one is, renewable energy is great, but in China, we have seen reports about the hydropower being a problem because they flood environmentally sensitive areas. And villagers and farms are relocated, often with unfavorable compensation terms. So what’s the story with the renewable on the hydropower? And the second question is, you hear about the electric power in the cities, but is this also going to be available in the countryside? In the rural areas? Do they have the charging stations and the vehicles out there? So I’ll listen from The Anchor. IRA FLATOW: OK. Happy Super Bowl. DENISE MAUZERALL: Sure. So hydropower does have environmental consequences. Certainly flooding areas makes them vanish. Putting up dams does change river ecosystems. So there is a cost there. On the other hand, it is air pollution and CO2-free form of electricity. And it’s also an excellent form of energy storage because with pumped hydro, as they call it, where you can pump water uphill, back into the dam when you don’t need it for electricity and let it out when you do need the electricity, it gives you a very inexpensive way of storing power. So that’s very attractive. As far as the electricity in the countryside goes, China is fully electrified. So there is electricity to almost every home in China, which is quite different than most developing countries. But the issue of where the charging stations are is real right now. There are not sufficient charging stations in the countryside for people to feel comfortable driving their cars long distances. But China is able to move extraordinarily fast on infrastructure development. And the expectation is that if they’re pushing– as part of their industrial policy– development of electric vehicles that they will go ahead and match that with deployment of more charging stations. IRA FLATOW: Have they put their money where their mouth is, instead? We’re going to take a break and come back and talk more with Fred Beach and Denise Mauzerall. Our number, 844-724-8255. Lots of people want to talk about this. I see we have a solar installer on the line. Maybe we’ll talk to him about what he thinks of the solar panel issue. We’ll be right back after the break. Stay with us. This is Science Friday. I’m Ira Flatow. We’re talking this hour about China’s growing energy needs, including its electric car market and power coming from solar cells, other kinds of places, with Denise Mauzerall and Fred Beach. Our number, 844-724-8255. Is this correct? Charles, are you there? IRA FLATOW: Now, you say you’re living in China. AUDIENCE: Yes. I’m in Arkansas on vacation, but yeah, I live in China. IRA FLATOW: And what’s your question? AUDIENCE: Well, in our apartments, there’s– you see all around, people utilizing small, personal energy devices, whether it’s little solar panels or these things on the roofs. I’m not sure what they do. They’re like water tanks in the sun. But the question is are they doing anything about efficiency in rooms? Like, our apartment is basically a concrete room, no double paned windows. And some of the doors, while they may look pretty, they don’t completely seal. So in the wintertime, it is cold. So are they doing any research into holding this energy that they’re consuming? IRA FLATOW: Fred Beach, do you have any thoughts on it? FRED BEACH: Same. Just casual observation for visiting there. I mean, it is interesting that in a communist country, obviously, they decide when the heat gets turned on in the winter and when the– gets turned off in the spring. I’m usually there in March, when it’s starting to warm up, and the heat is still on. You can’t open a window or turn on the AC because it’s not available. So I mean, they do have that level of control. But as far as building standards, I’d say it’s pretty rudimentary in general. IRA FLATOW: Let’s go to the phones to Rochester, Minnesota this time. Mika, hi. Welcome to Science Friday. AUDIENCE: I’m not sure if I’ve got a question or I guess a comment. So China’s put in more solar in the last year than the United States has ever put in. And they’ve got, of course, huge leader in wind and putting in that in [INAUDIBLE]. These power plants have an infrastructure cost, but once that’s paid off, they get free fuel for their entire life. If the United States doubles down on fossil fuels, our electric rates are going to continue to go up because fossil fuels aren’t getting any easier to get out of the ground. So I guess my concern is if their electric rates continue to fall with free fuel, and ours continue to go up because the fuel gets more and more expensive, what’s that going to mean for manufacturing and the economy? And are we hampering ourselves for the next 10, 20, 30 years in those sectors? IRA FLATOW: My screener says you’re a solar installer. Is that correct? IRA FLATOW: Is it worrying you, then? AUDIENCE: It worries me a little bit. It worries me more from an economic standpoint as us and any other business tries to stay in business and keep our costs down. If we’re competing on a global scale with companies that pay half as much electricity as us, then that could be a real challenge. FRED BEACH: I’d tell you not to worry too much. I don’t see anybody in the US who actually buys electricity doubling down on fossil fuels. We have a lot of political rhetoric in this country, but in general, the people follow the economics. And what you just stated is absolutely true. So most large commercial, industrial, and utilities in general, are not doubling down on fossil fuels. If anything, we’re marching in the opposite direction. I live in a small town north of Austin, where we’re 100% renewable as a utility. So I would say that is still the macro trend in the US. And if anything, we’ve probably got a lead on China in going cleaner and less expensive in our fuel sources than they are. IRA FLATOW: I’m sorry. Go ahead, Denise. DENISE MAUZERALL: I was going to say, I do view this effort at the federal level, to emphasize fossil fuels and coals, as being a long-term handicap for the United States. I fear that the plans to cut funding for renewable energy research and development is a major disadvantage to long-term prospects in the US because China will move in and we’ll be left behind. FRED BEACH: Will move in and do what? DENISE MAUZERALL: Move in to selling renewable energy to the world, will move, as the caller pointed out, to having, in the long-term, cheaper electricity with lower emissions of air pollution. In the US, the Department of Energy had a report that I believe there’s something like 60 million jobs in coal and over 200 million in solar right now. And so this idea that you could protect jobs by protecting coal, I think, is misguided. FRED BEACH: Oh, I think it’s not just misguided. It’s wrong and unrealistic. So I don’t really see an issue. IRA FLATOW: But does China see– it’s interesting you mention the studies that there is a vacuum here now. Does China realize this and know it’s going to move in? And become a world leader? IRA FLATOW: You know, we pulled out of the Paris Agreement. China said, hey, that was sort of silly. DENISE MAUZERALL: Yes, it sees this as an opportunity. I think the US pulling out is not going to deter China from moving forward with renewables. I think it’s– it has this new international trade plan called Belt and Road initiative, where they are planning to take advantage of, somewhat, of a global vacuum left by the US, and they plan to expand trade on renewable energy and electric vehicles. FRED BEACH: That seems curious. I mean, we’ve pulled out of the Paris Accords, yet our emissions are coming down year on year. China is still a part of the Paris Accords, but their agreement is to continue increasing emissions year on year. So I don’t see how we’re giving up or going away from anything. IRA FLATOW: All right. We’ll leave it right there because there’s a lot more to talk about, and we’ll take some other time to do that. We’ve run out of time. Denise Mauzerall is Professor of Environmental Engineering and International Affairs at Princeton and Fred Beach, Assistant Director of Energy Policy at the Energy Institute at UT, Austin. Hook ’em Horns, for you there. Have a great weekend. IRA FLATOW: Just a quick note. Denise Mauzerall wanted to correct a figure she quoted during this segment. She says according to the Department of Energy, 374,000 people work in solar and 160,000 in coal, so solar electricity generation employs twice as many people as coal power. A new study is mapping how much air pollution city bikers encounter on their daily routes. Will Kentucky loosen regulations for toxic power plant byproduct?